Mark Macluskie packed his belongings and left home for the first time to attend college this fall. The winner of one of 20 coveted Flinn Scholarships, Mark has a full ride to study mechanical engineering with two minors in electrical engineering and mathematics at Arizona State University. Mark is the consummate scholar: intelligent, charismatic, a whiz at math. A music junkie, the 19-year-old can often be found listening to the classic rock sounds of Rush, the Rolling Stones and the Ramones. He cites Spotify as being his most used app, one that he regularly escapes into when everything around him is silent. 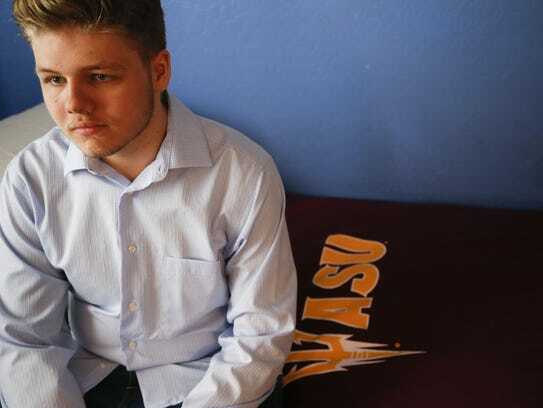 Before heading off to ASU, Mark had the typical worries of a college freshman: juggling his schoolwork, keeping up his GPA for his scholarship and sharing a bathroom with a stranger for the first time. Two months in, things are going well. His classes are easy, save for chemistry, he said, and the transition to dorm life has been seamless. "It's basically like living on my own. It's been great." But the road to college has not always been easy for Mark, who was diagnosed with autism as a toddler. Mark had been ahead of developmental milestones as a baby, walking at 7 months old and using two-word combinations by 10 months old. By the time he was 14 months old, he had lost all use of his language. His mother, Cynthia Macluskie, was unfamiliar with the word autism when a doctor read her Mark's diagnosis in 1999. After taking Mark for a second opinion, Cynthia was told she should prepare to one day institutionalize her only son. Later, she says it was the best thing that ever happened to her. 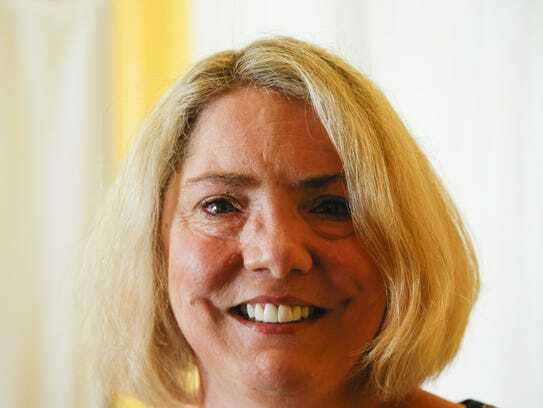 Armed with a diagnosis that emboldened her to try anything she could to help her son, as well as unfettered access to the internet, Cynthia devoured every piece of research and anecdotal evidence about autism that she could find. Cynthia quit her job in human resources, took out a second mortgage on their Cave Creek home and set to work training herself to help her son succeed. Mark's father, Kevin, went back to school in order to build his career as an engineer so Cynthia could afford to stay at home with Mark. First, the family changed their entire diet, completely cutting gluten, dairy, soy, preservatives and dye out of their home. With no Whole Foods yet available to supplement the family's diet, Cynthia would scour kosher Jewish stores and Asian markets to find suitable foods. After this, she said the tantrums and headbanging stopped. Slowly, Mark began speaking again. Next, their home was rid of all chemicals and environmental triggers, down to 100 percent cotton clothing and organic sheets. Carpet was ripped out. Cleaning supplies were tossed in favor of vinegar and baking soda. Cynthia credits these experiments with allowing her to see what helped her son. "You ask some doctors, and they'll say there's no research, so why try it?" she said. "But experts don't pay any price if they're right or wrong about your child. Only you pay the price." After pulling Mark out of a developmental preschool where Cynthia said he was fast losing skills, she began homeschooling her son, implementing her own behavioral therapies for 40 hours a week, supplemented by speech and occupational therapy the state provided. Cynthia would often use the TV as a teaching tool for social thinking and social cognition therapy. Together, mother and son would sit on the couch, watching shows like "Leave It To Beaver" and "Little House on the Prairie." Cynthia would ask Mark to make guesses. What do you think that person is feeling right now? These exercises are important for children with autism, who often fail to pick up on social cues from others. "I remember hating Little House on the Prairie." He grimaced. "I still do." Cynthia had no background in education and the family never anticipated home-schooling, but mother and son quickly found a rule that worked for them: if any curriculum made Mark or his mother cry, they would throw it away and try something new. "The nice thing about homeschooling is that you can find whatever curriculum is great for your kid," Cynthia said. "It really allowed Mark to focus on his extracurriculars and what he was passionate about." By age 7, Mark was an avid pianist. At 13, after receiving an electronic drum set for Christmas, he switched to drumming. 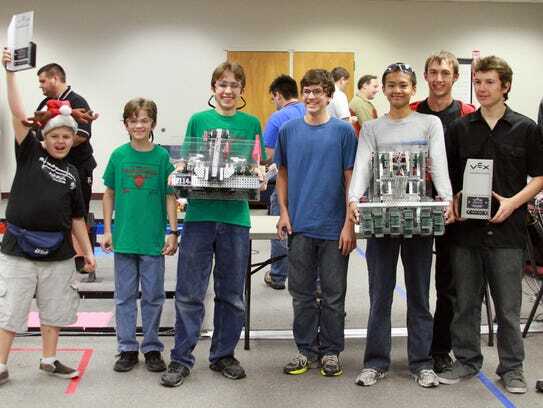 He also showed an aptitude for math and technology, competing in his first Vex Robotics World Championship at age 13. At 16 years old, Mark hosted a weekly Internet radio show called "Tech Team," which was the No. 1 radio program on the KidStar network, garnering more than 30,000 listeners every week. Mother and son both credit his personalized homeschooling curriculum as the perfect environment to help him pursue these hobbies. "Homeschooling is very individual, whereas in public school there wouldn't be a lot of chances for me to succeed," Mark said. "Arizona has a lot of freedom of choice when it comes to education. I would hope that most people ultimately pick what works best for them, just like homeschooling worked for me." Dr. Raun Melmed, the doctor who initially diagnosed Mark and medical director at the Southwest Autism Research and Resource Center (SARRC), praises Cynthia for actively working to address Mark's individual needs. Too often, he said, families fall into the trap of comparing themselves to and blindly following the blueprints of other families' success. "As long as parents are educated and well-informed, they should be encouraged to do what they need to do," Melmed said. "Parents are essential in their child's life and intervention and they must be encouraged to follow their gut." Cynthia calls it a "mommy gut." "I know when I can push him and when I can't. No one else knows that but a parent," she said. When Mark was 8-years-old, despite some residual symptoms, Melmed changed Mark's diagnosis to high-functioning autism. With this new diagnosis, Mark was taken off of state services, despite lingering dyslexia and dysgraphia, which impacted his reading and writing. It was at this time that Mark and his mother shifted their focus from working solely on Mark to working with their local autism community. 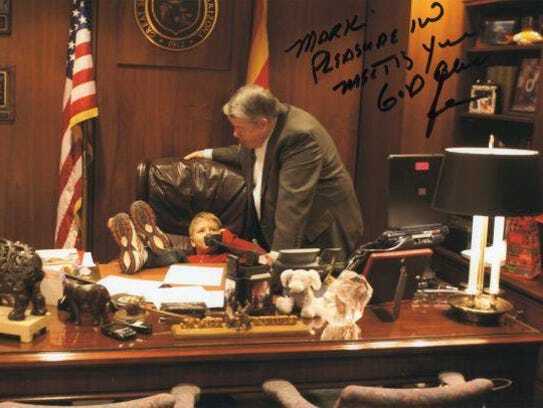 In 2008, Steven’s Law, an insurance bill that required many private insurers to begin covering the costs of services for individuals with autism under the age of 16, was introduced before the Senate Health Committee at the Arizona Legislature. Mark and his mother spent months working to get the bill passed, collaborating with other parents of children with autism to lobby Arizona's representatives. With the vote scheduled to be 2-4 against their favor, Cynthia made her testimony in front of Arizona senators, detailing the sacrifices she had made for her son and the work she had put in, often without the help of the state assisted programs. Cynthia laid bare her worst insecurities in front of the Senate: Am I doing enough? Am I a good enough mother? As she began to cry, an 8-year-old Mark intuitively leaned over to hug his mother in front of the congregation. The bill unanimously passed out of committee and was approved by the full Legislature, taking effect July 1, 2009. By the time he reached 11, research collected by the National Institutes of Health's Good Outcome study concluded that Mark no longer met the criteria for autism. When Mark first received his diagnosis, only one in 500 children were diagnosed with autism. Today, approximately one in 64 children will be diagnosed with a spectrum of disorders classified under the autism umbrella. The differing levels of severity and the factors influencing them make treating each case unique. The spectrum of outcomes for each individual is impossible to predict, according to Melmed. As a result, doctors often talk in terms of the most optimal outcome for each individual patient. While some, like Mark, will lose their diagnosis by the time they reach adolescence, many will fall elsewhere on the spectrum, with varying levels of social and functional impairment. "We don’t know what’s happening on the inside of these individual’s brains," Daniel Openden, president and CEO of the Southwest Autism Research & Resource Center, said. "Maybe they have it and have learned to function around the impaired parts. As a result, we try to talk in terms of optimal outcomes, or no longer showing symptoms of autism." Early diagnosis and intervention are considered the best way to achieve optimal outcomes, but doctors advise parents to focus on the unique needs of their child without comparing their journey to others. "Mark is to be celebrated for everything he has accomplished, but we need to have the same celebration for someone who is non-verbal at age 22 and recently become toilet trained," Melmed said. Other groups such as the Autistic Self Advocacy Network (ASAN) maintain that the truly optimal outcome is reached simply when an individual with autism is happy and feels that they are living a good life. "There’s a common and really harmful misperception out there that the best outcome for an autistic person is to become "indistinguishable" from non-autistic people, and learn to act in a normative way so that people observing them would not know they were autistic," said Zoe Gross, director of operations at ASAN in Washington, D.C. "Autism is about how an autistic person experiences the world — not how we appear to others." Cynthia worked hard to help her son but, "we were also lucky," she said. "I know people who did everything we did and didn't have the same outcome. We found the right things at the right time for him." Mark's dorm room at ASU is now peppered with the music posters that once adorned his Cave Creek bedroom, posters of bands including Slayer, Iron Maiden and Amon Amarth. Mark also meets up weekly for dinner with the other 19 scholars in his Flinn cohort. "It's been nice to have that support network going into college," he said. Mark is already looking forward to living off campus next year with one of his Flinn peers, and moving the drum set stored at his parents' house into his new place. The college student seems ready to leave behind the last chapter of his life, a chapter dominated by his diagnosis and the story of how he overcame it. “Autism is not my identity,” Mark has said. "I don't mind people being curious or asking questions, but it's never been how I want people to define me." Part of forging this new identity means living away from the mother to whom he is so closely bonded. While Cynthia says the adjustment has been hard, she relishes in the new joy each of her son's accomplishments brings her and looks back at how far he has come. "You never take anything for granted. Every achievement he has is a big win for me and my husband." Cynthia pauses. "Although I cry a lot more than my husband."